MINNEAPOLIS — The Dar Al-Farooq Islamic Center in suburban Minneapolis, like other U.S. mosques, occasionally receives threatening calls and emails. Its leaders say they're more frightened now after an explosive shattered windows and damaged a room as worshippers prepared for morning prayers. "We feel like it's much deeper and scarier than like something random," Mohamed Omar, the center's executive director, said Sunday. "It's so scary." No one was hurt in the blast, which happened around 5 a.m. Saturday. Windows of the imam's office were shattered, either by what the FBI called an "improvised explosive device" or by an object thrown through them. The FBI is seeking suspects and trying to determine whether the incident was a hate crime. Gov. Mark Dayton joined other public officials and community leaders for a meeting inside the building Sunday, describing the bombing as "so wretched" and "not Minnesota." "This is an act of terrorism. 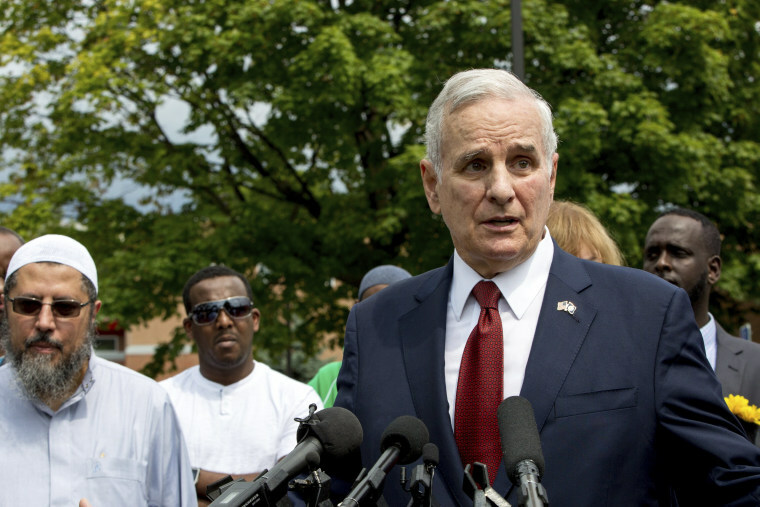 This is against the law in America," Dayton said at a news conference afterward, the Star Tribune reported. Besides serving as a place of worship and community center, the mosque in Bloomington, just south of Minneapolis, has a fitness center, gymnasiums for boys and girls, a football field and adjoins a city park, Omar said. He estimates the mosque holds up to 300 worshippers for Friday prayers. The community center also hosts computer classes, a basketball league, religious classes, lectures and other events. "It's a place that a family can come and get everything they need," Omar said. The mosque opened in 2011 at the site of a former elementary school in the suburb of about 85,000, and serves people primarily from the area's large Somali community. Minnesota is home to the largest Somali community in the U.S., roughly 57,000 people, according to the latest census. Some residents opposed the center's opening, and complaints have been made about parking, noise and traffic, the Star Tribune reported. Omar said the center gets along with "92, 93 percent" of its neighbors. And while the mosque has received threatening calls and messages, Deputy Bloomington Police Chief Mike Hartley said Sunday he was unaware of any hate crimes reported at the center. Reports of anti-Muslim incidents in the U.S. are increasing, including arson attacks and vandalism at mosques, harassment of women wearing Muslim head coverings and bullying of Muslim schoolchildren. Also in Minnesota, an Islamic cemetery in Castle Rock Township recently reported it had been vandalized with spray painted profanities and swastikas. A U.S. Department of Homeland Security statement on the Bloomington explosion says the department "fully supports the rights of all to freely and safely worship the faith of their choosing and we vigorously condemn such attacks on any religious institution." The reward for information leading to an arrest or conviction has grown to $24,000, said Asad Zaman, director of the Muslim American Society of Minnesota. The Minnesota chapter of the Council on American-Islamic Relations, or CAIR, said its national office is urging Islamic centers and mosques to step up security. "If a bias motive is proven, this attack would represent another in a long list of hate incidents targeting Islamic institutions nationwide in recent months," said Amir Malik, the local chapter's civil rights director.